What do you call a blind dinosaur? A doyouthinkhe-saurus. Puns hold great power. But it is a pernicious kind of power and one that should be avoided. Now it's possible his objections are entirely aesthetic. Comedy really is a matter of taste. But I think there is something to it. While some people do enjoy the humour in puns, there is an inescapable groan-worthy quality to them that few would deny—it's just a different kind of funny. How do you divide thirty cubes of sugar amongst three cups of coffee such that each cup contains an odd amount of sugar. This is followed by the usual brain teaser caveats like, "no breaking sugar cubes in parts" and "no banishing cubes of sugar into alternate dimensions". The "correct" answer (if that word is to have any coherent meaning) is that the task is impossible. An odd number plus an odd number is necessarily an even number and an even number plus an odd number is necessarily odd. So solutions only exist if the total number of sugar cubes is odd. You place one cube in the first cup [odd], one cube in the second cup [odd], and then twenty-eight cubes in the final cup, which is an odd quantity of sugar cubes to have in a cup of coffee. While this may pass as a minor intellectual joke and you can respect the ingenuity and cleverness behind it, the answer strikes all who hear it as cheating. But is this a legitimate objection? Doesn't it only matter if the solution is effective or not? The answer is, "Yes, this is cheating!" precisely because the solution does not work. One of the clearest signs that this does not work is that if you translate the problem into another language besides, it becomes insoluble. And intuitively we know that if the problem is about properties of objects in the real world, it is that they are independent of language. The properties of a sugar cube and a coffee cup should be invariant under translation from English to French. There is actually a rule in making a logical argument that you are not allowed to alter the definition of words you use in the middle. To break that rules is to commit the fallacy of equivocation. The idea that words don't change their definitions over time is central to all kinds of argument. If A implies B and B implies C, then A implies C. But this is only true if someone hasn't made sneaky modifications to what we mean by B in the middle. Otherwise the whole enterprise breaks down. Think about how you would feel if you had a significant other that promised never to cheat on you, was free to be flexible with the definition of cheat. If you skip to the 13:30 mark, you'll see someone try and claim that "Un huh" doesn't strictly mean "yes" so that they can deceive an insurance company to pay for prescription opioids. This is not to try and advocate for linguistic prescription where you have a committee which decides once and for all what words must mean and resists any effort to change them. Wicked can occasionally mean something good or something bad, and that definition can change—but not in the same conversation. But this kind of strategic redefinition of words is not about any kind of intellectually honest problem solving. It's more about cherry picking and massaging the facts to agree with a pre-determined conclusion. The appearance of the comic and the newscast coincided with coming across a solution to the sugar problem which actually works. (Thanks to Richard Wiseman's 101 Bets you Will Always Win.) Instead of messing with the definition of "odd", we mess with the definition of "coffee cup" to be a paper cup (as at Tim Hortons or Starbucks) so that one cup can fit nested inside the other. Arrange the cubes so that you have two cups containing odd numbers then one containing an even number. (The 1-1-28 from above works here.) To solve the problem lift one of the odd cups and place it inside the cup with the even number of cubes. Now this cup contains an odd number (albeit with a cup in the way) and so does the one above. It's not a funny solution but it is an effective one. When trying to engage in problem solving and critical thinking, the solutions you explore need to be grounded in reality. There is a (very dangerous) kind of magical thinking where we can be led to believe that by changing the name of a thing, we can change the properties of a thing. In the real world it's not possible to define your problems away. Along these lines I was shown this "math" problem (taken from this clip by #Mind Warehouse). 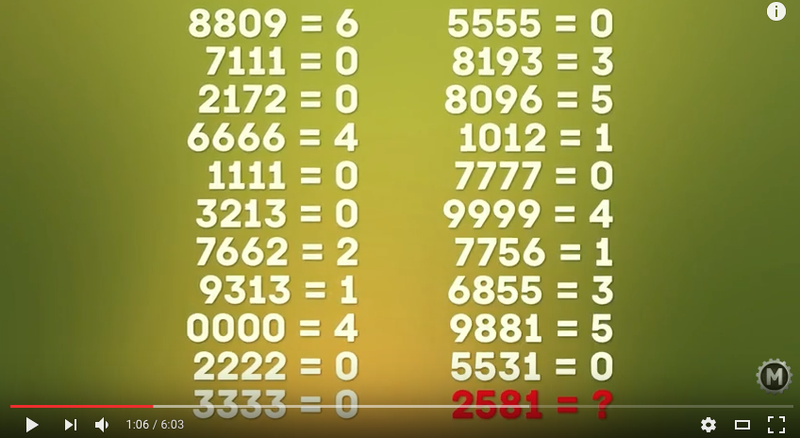 The solution (in case you're not willing to watch the video... spoiler alert) is that the "equals sign" is counting the number of holes in the numerals in the numbers. (0000 = 4, 1111 = 0). Setting aside the enjoyment and satisfaction you might feel in treating this as a brain teaser and staring at it for an hour or two, as a "problem to be solved" it fails to grasp how numbers actually work. The shape of the numeral isn't a meaningful property of the number. In fact, it's entirely arbitrary—an accident of history—what shape they take. The shape of the digits in 200, is meaningless. That's just the way we've agreed to represent, as a convenient shorthand, a pile of two hundred somethings. The answer changes if you change to a different alphabet (or if you insist, "Roman Numerals"). You can't pursue this kind of thinking in real world problem solving. Once you do, you may as well just redefine bankruptcy as victory and borrow your way to a successful business.